The transfer window catches fans into a frenzy and everyone is given hope of signing players. Virgil Van Dijk and Naby Keita could not come to Liverpool. But one player might be. 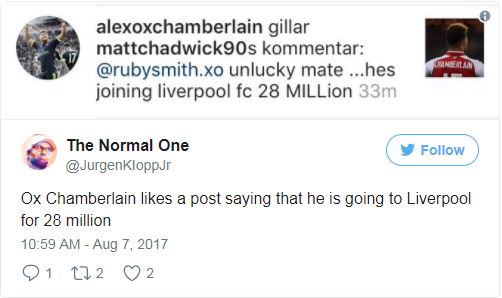 Alex Oxlade Chamberlain, who represented Arsenal in their Community Shield win over Chelsea, might have dropped a hint that he's moving to Liverpool in this summer transfer window. Jurgen Klopp has kept his eyes on signing him for months, and the deal might just go through. With hopes for signing Naby Keita gone, at least for this summer Chamberlain might be a good addition for the Reds for the upcoming hectic season ahead.